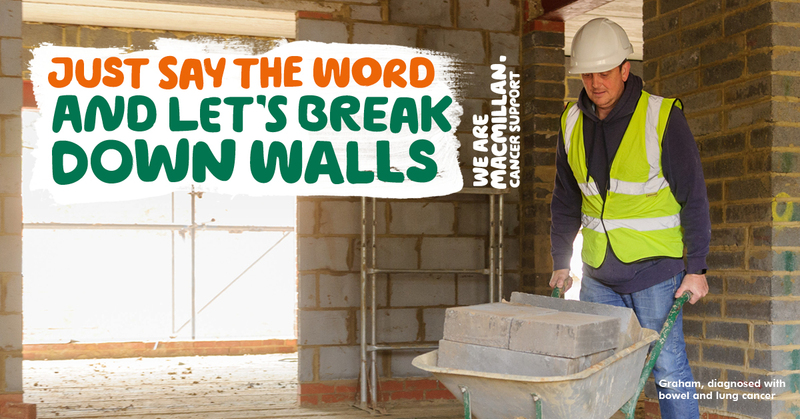 Today Macmillan Cancer Support is uniting with nine companies from the construction, electrical and home improvement sector for their ‘Just Say the Word’ male cancer campaign. Benchmarx Kitchens and Joinery, CEF, ISG plc, Mace, Selco Builders Warehouse, telent Technology Services, Topps Tiles, Travis Perkins and Wolseley have joined forces with the charity to raise awareness of the impact of cancer on men and encourage those who need it to access support. A cancer diagnosis can have a significant emotional impact, and the charity says being able to talk is an important part of coping with the disease. Yet new Macmillan and Toluna research reveals more than 1 in 4 tradesmen (26%)[i] wouldn’t feel comfortable having a serious conversation about any health concerns with their work colleagues. Back for a third year, ‘Just Say the Word’ is supported by more companies than ever before. These businesses will put aside their commercial differences to support men living with cancer and their families. Previous years have seen a great response with some colleagues and customers reporting the campaign inspired them to seek vital medical support. The importance of seeking support is emphasised by the emotional issues reported by tradesmen with a serious illness such as cancer. Over 1 in 3 (36%) experienced depression, 2 in 5 (40%) anxiety and 1 in 10 (12%) shame, after they were diagnosed. From 23rd April – 6th May, the ‘Just Say the Word’ campaign will see Macmillan Cancer Support have a visible presence in branches and sites of the nine participating partners. Posters and leaflets will signpost men to support, and encourage those with health concerns to get support. Employees at all levels will also spend the two-week period fundraising for Macmillan, raising money to help the charity provide support to people living with cancer across the UK.